Many people spend a large part of their day in front of a computer screen – whether it’s a desktop computer, a laptop, tablet or even a smartphone. These days, in fact, it’s rare to find a working environment where computer screens aren’t used. Think about your average day: how many hours of it do you spend working at your computer? How often is computer work broken up with other tasks? Do you take the time for a lunch break away from your desk? Most of the time, display screen equipment – like your computer – is completely harmless. However, if you spend prolonged periods in front of it (such as several hours each day), it can pose significant health risks, like those listed above. Have you ever noticed yourself getting headaches, back pain, or sore wrists whilst working at your desk? Carrying out tasks for long periods without suitable rest breaks. Take a look at the following tips to help improve your posture when working at your computer. Each section outlines the best way to sit and gives a few examples of ways to stretch, relax and improve your overall wellbeing. When sat in your desk chair, your spine should be in an upright position. Avoid slouching down into your chair or leaning forward onto the desk, as this can cause strains, aches and pains. Your lower back (lumbar) should be supported by the chair or a cushion so that sitting upright doesn’t feel uncomfortable or unnatural. Stand up and walk around every hour or so, so that you’re not sat in the same position all day. Slowly lean your torso over to one side of the chair and then the other to stretch your sides and spine. Stand up and put your hands together, elbows out, then slowly twist to the left and then to the right. Also, keep your neck straight as much as possible. Your eyes should be level with the area of your computer screen that is 2-3″ below the top. Adjust the tilt and height of your screen or your chair if you need to and, if you have a laptop, consider using a stand to raise it up. If you ever have to angle your head upwards or downwards to see the screen, then tension can build up in your neck and cause headaches and fatigue. Sit up straight and slowly tilt your head down to one shoulder and then to the other to stretch your neck. Move your shoulders around in small circles, first in one direction and then the other. Slowly bring your chin down to your chest, hold for 3 seconds, and then release. There should be enough room in front of your keyboard to support both your forearms and your wrists on the desk. Push your computer screen and your keyboard back a bit if necessary. This desk support helps prevent your arms from becoming tired or achy. When typing, keep your wrists straight. If you have to bend your wrists upwards to reach the keyboard then use a wrist support, otherwise you are at risk from a repetitive strain injury. Reach your arms out in front of you and draw big circles with your wrists, first in one direction and then the other. Stretch your arms out to the side as far as you can and then above your head as high as you can to stretch your arms, wrists and back. Interlock your fingers and then push them out in front of you, with palms facing out. Your desk chair should be positioned so that you can sit comfortably with your feet flat on the floor and your lower legs vertical. Use a footrest underneath your desk if you need more support, or if the chair is putting pressure on your thighs. Make sure that there’s enough space to change position and stretch your legs out every now and then, too. Rotate your ankles round in circles under the desk, first one way and then the other. Stand up and march on the spot for 30 seconds to improve the blood flow in your legs. Stand on your tiptoes and stretch upwards, as tall as you can, to release some of the tension in your ankles, legs, back, arms and neck. Prolonged use of a screen can cause visual fatigue and eye strain, so it’s important to look after your eye health. If your job involves working with a display screen for the majority of your day, whether it’s a desktop computer or a tablet, then your employer is required to provide you with eye tests so you can make sure you’re able to see the screen clearly and work comfortably. If an eye test shows that you need glasses specifically for computer work, then your employer is required to pay for the basic frames and lenses under the Health and Safety (Display Screen Equipment) Regulations 1992. Reposition the screen to avoid glare from lights or windows. Keep the screen clean and use a desk lamp to make it easier to see. Ensure the screen colours are easy to look at, and that the characters are sharp and legible. Look away from the screen into the distance for a few moments to relax your eyes; focus on something 30 metres away for 30 seconds every 30 minutes. 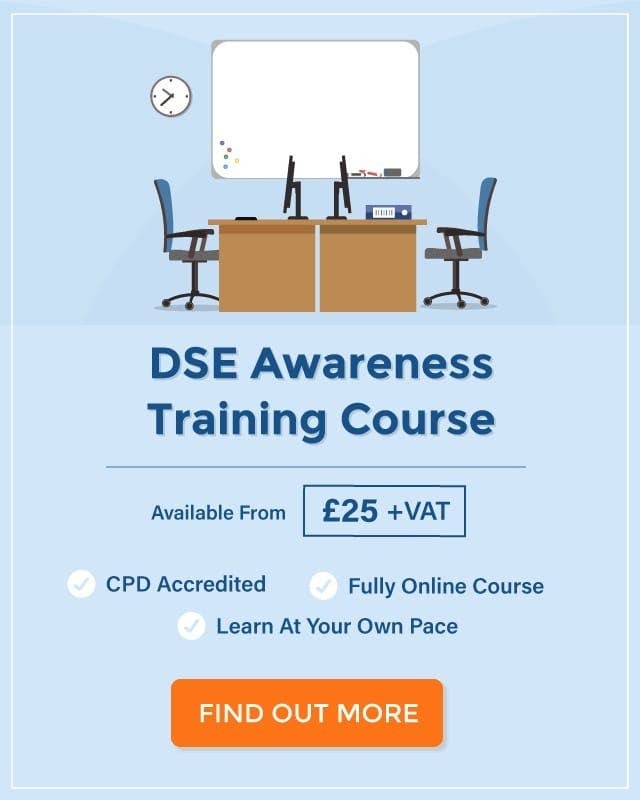 If you’d like to learn more about display screen equipment health and safety, take a look at High Speed Training’s online DSE Awareness Training Course. 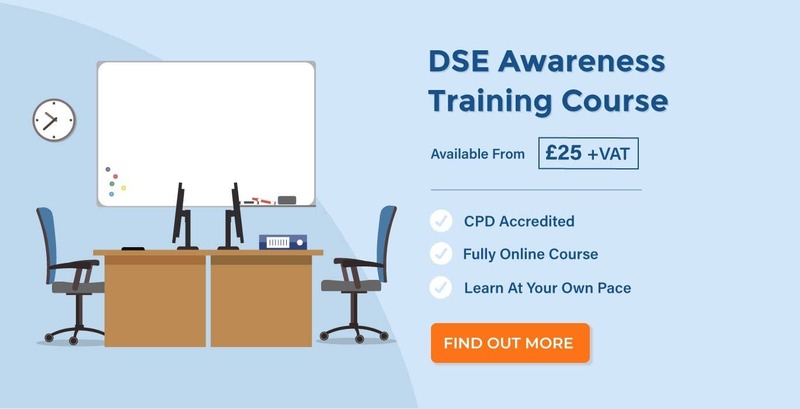 The course covers everything you need to know about legal responsibilities, correct workstation set-up and risk assessment. We also have a great free resource available to download which can help you assess your computer workstation and eliminate any risks: visit our DSE Workstation Assessment Checklist.